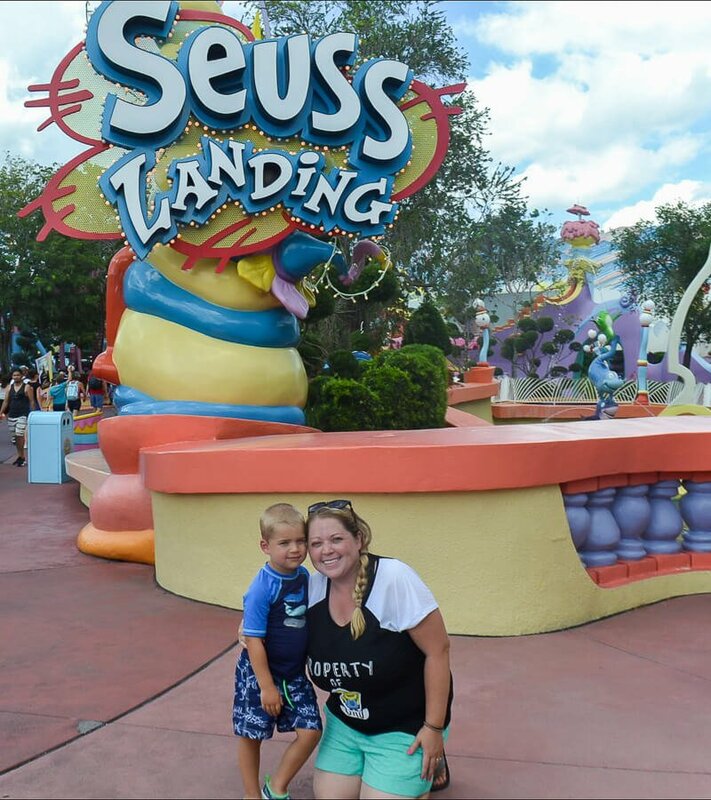 The ultimate guide to visiting Islands of Adventure & Universal Studios Orlando Florida with young kids! Everything you need to know from the best tickets to ride heights and kid rides that will be appropriate for young kids! 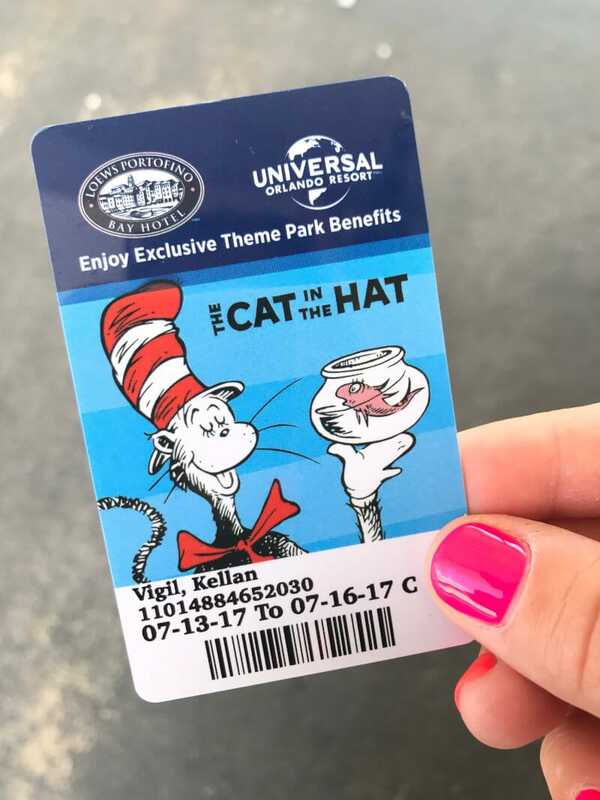 Just like the Universal Studios express pass, this guide is a must-have if you’re visiting Universal Studios Orlando with kids! 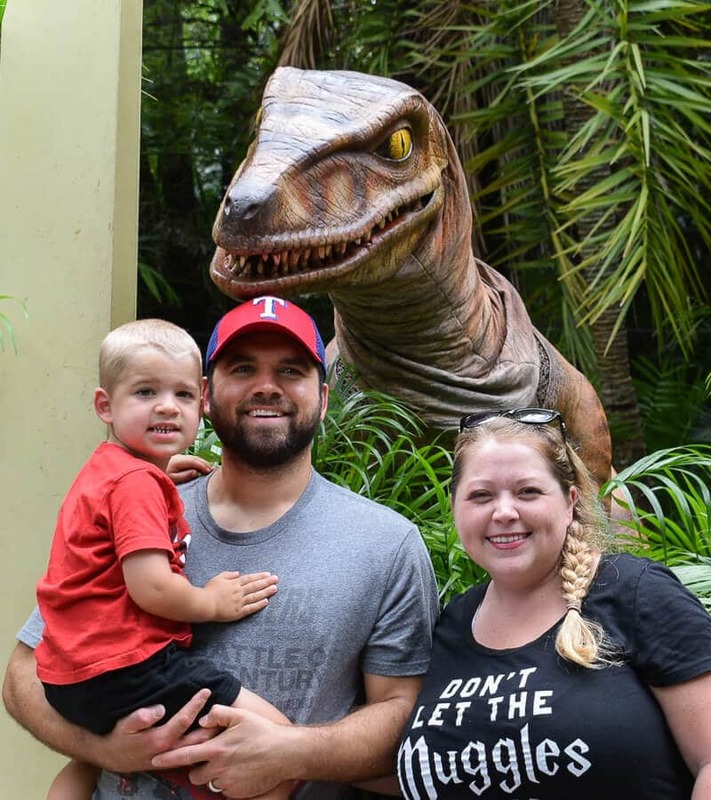 We recently visited Islands of Adventure and Universal Studios Florida with my 4-year-old son and let me tell you, visiting with adults and visiting with young kids is a totally different experience. When I’m with just adults, we beeline it to the biggest coaster as soon as the park gates open. With my preschooler, we never even made it to the biggest coaster! 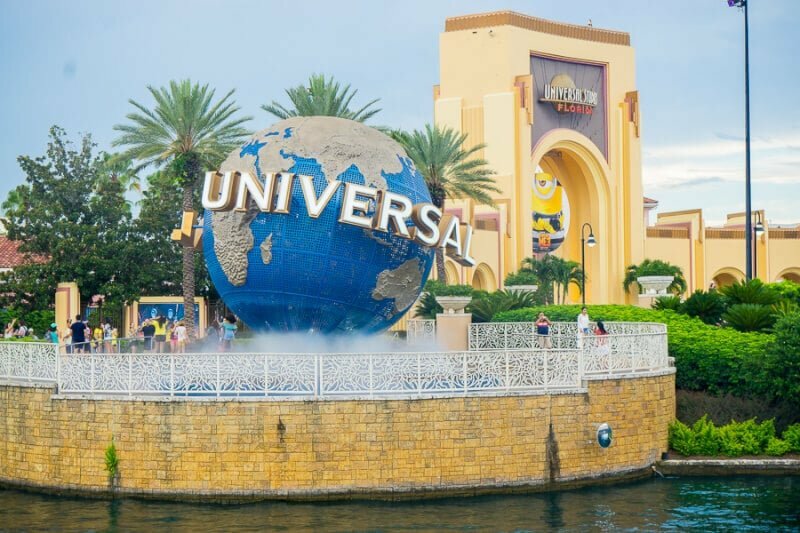 This is the ultimate guide to visiting, aka everything you need to know, about taking young kids to Universal Studios Orlando! We loved it and hope you will too! To make it easier to navigate this crazy long post, I’ve put together a menu here to help you click around. Just click on the topic you’re looking for to be taken directly to that topic. And when you’re done with the topic, click the “Return to Menu” button at the bottom of the section to hop back up here. Hope it helps! There are a ton of different ticket options you can purchase, including ones that come with hotel packages. These are just the basic options you can get on the Universal Studios Orlando website. My recommendation for visiting with young kids and trying to enjoy all three parks to the fullest would be to get a 3-Park, 3-Day ticket. If you’re not planning on visiting Volcano Bay, I still recommend doing the Park to Park 3-Day ticket because it’s only currently about $20 more than the 2-Day one and it’ll give you more time to explore all the play areas, relax in your hotel pool, and enjoy CityWalk. And while you might be tempted by the one park a day options, if you don’t do the park to park option you won’t be able to ride the Hogwarts Express between the two parks, and it’s awesome. And honestly, we love to do one park in the morning, take a nap, then do the other park in the evening. The park entrances are minutes from each other making it simple to do both in one day. Tip: You can get a Universal Studios tickets discount by purchasing online ahead of time rather than buying the day of in the park! It’s definitely worth making the decisions ahead of time! If you’re going to splurge on one thing at Universal Studios, splurge on express passes. If you don’t know what an express pass is, it’s basically a pass that allows you to go in the Express pass lines on almost all of the rides at both parks. There are a handful of exceptions like Pteradon Flyers but most rides accept them. When you’re at an amusement park with young kids standing in line is the last thing you’re going to want to do, especially if it’s hot. We had an unlimited express pass for all three days we were at the parks and even when the ride lines were almost 90 minutes long (Minions Mayhem), the express pass line was never more than 10 minutes. Not only were we able to go on a ton of rides, we didn’t ever have the waiting in line meltdown that happens way too often with young kids. There are a handful of different types of express passes depending on if you want it for one-park, park to park, or 3 parks, and I recommend you go with whatever your tickets are. And I recommend getting the unlimited version unless you only want to ride each ride once. The regular version only allows you to ride each ride one time and more than often, young kids like to ride things more than once. Or better yet, stay at a premium hotel like Portofino Bay and the unlimited express passes are included for every guest. Another great option to shorten line time is a VIP tour, which I’ve been told is totally worth the cost! Tip: Bring a lanyard of some sort for all the adults and older kids in your family. The express pass is just like a regular paper ticket, and you have to get it out and show it for each ride. Being able to have it around my neck in a lanyard pocket made it so much easier to get in and out. I could go on and on about the food options, but I’m saving that for another post. These are just my tips for eating at and near the parks. You can bring in snacks and drinks as they follow these guidelines such as no glass containers, only snacks that don’t need heated, etc. We were doing Whole 30 during our most recent visit and brought in things like dried fruit, nuts, and bottled water to drink. There are plenty of grocery delivery services, even like Amazon Prime Now, that will deliver groceries to your hotel for when you arrive so you have snacks on hand. Eating in the parks can get expensive, so I like to save it for special occasions and bring snacks from home to balance out the cost. There are a ton of places to eat in all the parks. I’ll be covering my favorite food in another post but for now, I highly recommend that if you’re going to pay to eat in the parks, make it memorable. 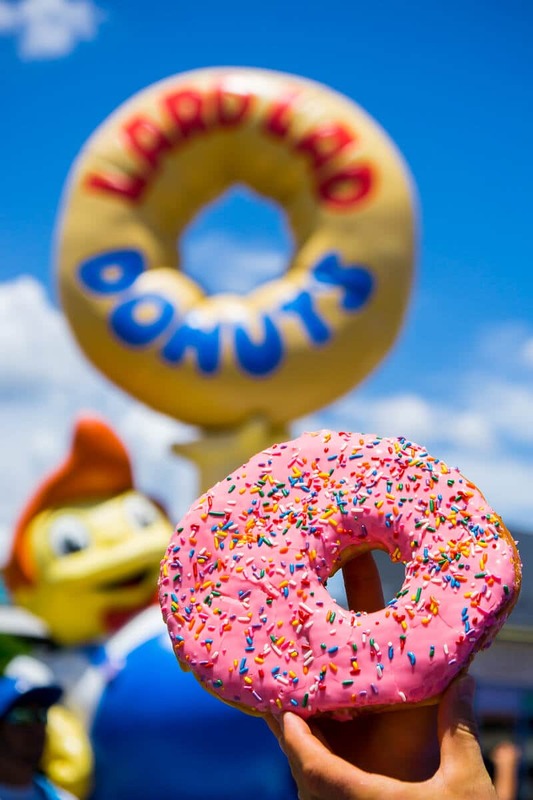 Either eat at Mythos inside a cave, try some Butterbeer from Harry Potter, or even get a Cat in the Hat cookie or The Big Pink Donut in Springfield USA. Skip the traditional turkey leg, hot dogs, and chicken tenders you can get anywhere and make eating part of the experience as well. 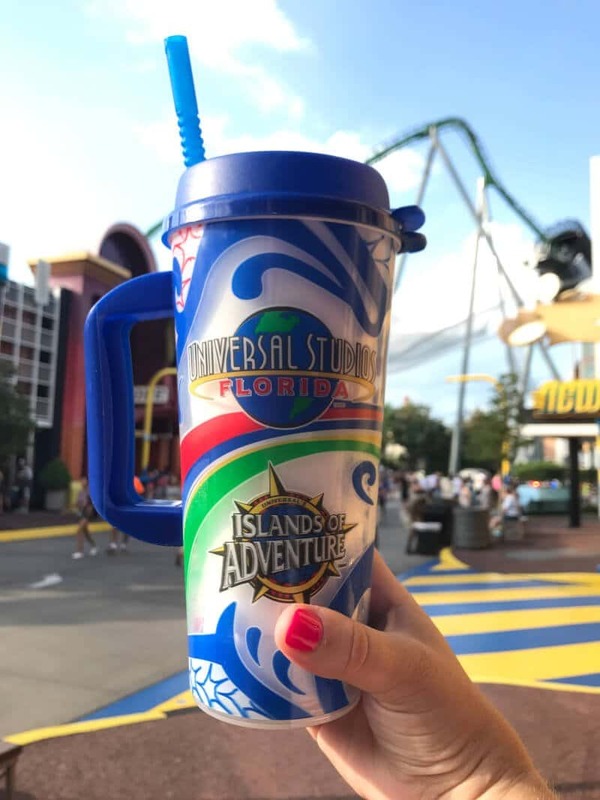 If you have a bigger family or know that your family drinks a lot of soda, get a refillable souvenir drink cup. When we went it was $14.99 for one and less if you bought more. You can get refills throughout all the parks for that day for free either at their Coca-Cola machines or vendors who serve fountain drinks. The second day and any additional days after cost $7.99 per day for the free refills. It’s definitely a good deal if you’re planning to drink much in the parks since a bottled soda or fountain soda drink normally runs at least a couple of bucks. We don’t drink a ton of soda, but I got the cup anyway and used it for the duration of our trip to get ice water refills. Normally the food vendors will give you a tiny lidless cup of ice water for free but having the refillable drink cup allowed us to have a large cup of ice water on hand through our entire trip. And bonus, I didn’t have to pay again on the second and third day because we only used it for ice water. One way to enjoy great food without missing out on too much time in the parks is to eat at one of the awesome restaurants at CityWalk instead. There’s everything from the sushi + burger joint Cow Fish (so good!) 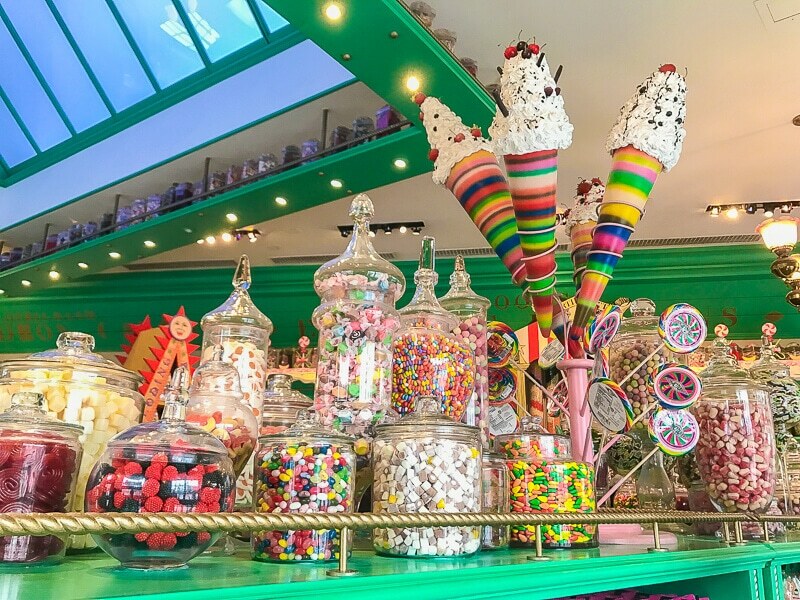 to the Toothsome Chocolate Emporium that serves more than just good chocolate and milkshakes. 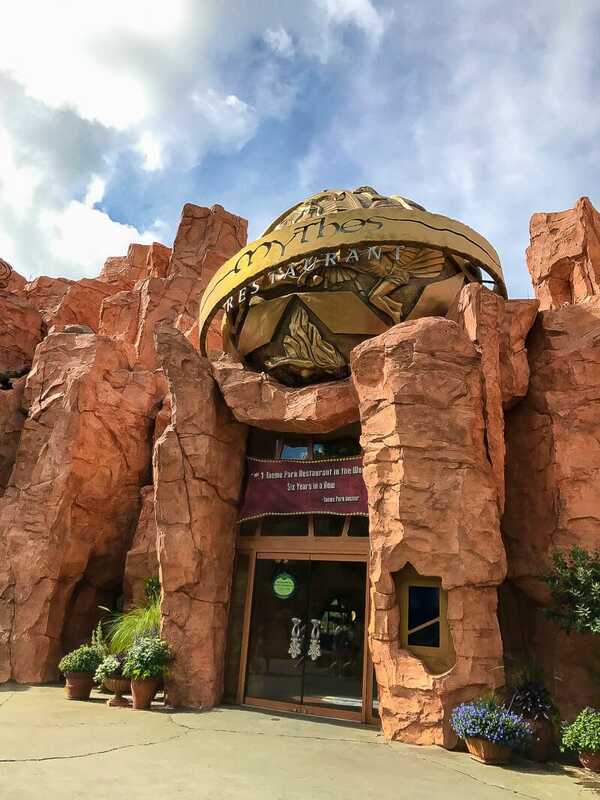 For the more popular restaurants or busier days, get a reservation ahead of time or go at lunch when other people are in the parks and enjoy time in the parks during dinner instead. Another bonus? The meals in CityWalk were about the same price as in the park and with Mythos being the exception, we enjoying our CityWalk meals about 100% more than the entrees in the parks. Try to get reservations if you can. If not, put your name on the list at a popular restaurant early. Most restaurants asked for our phone number and sent us a text message when our table was ready, so we could go walk around without fear of losing our spot in line. Universal Studios is one of the few places that you really don’t need a car at all. Unlike other theme parks where I recommend renting a car (especially with young kids), I don’t recommend it when you visit Universal Studios because the hotel parking is pretty expensive ($18+/night) and the transportation system is fantastic. 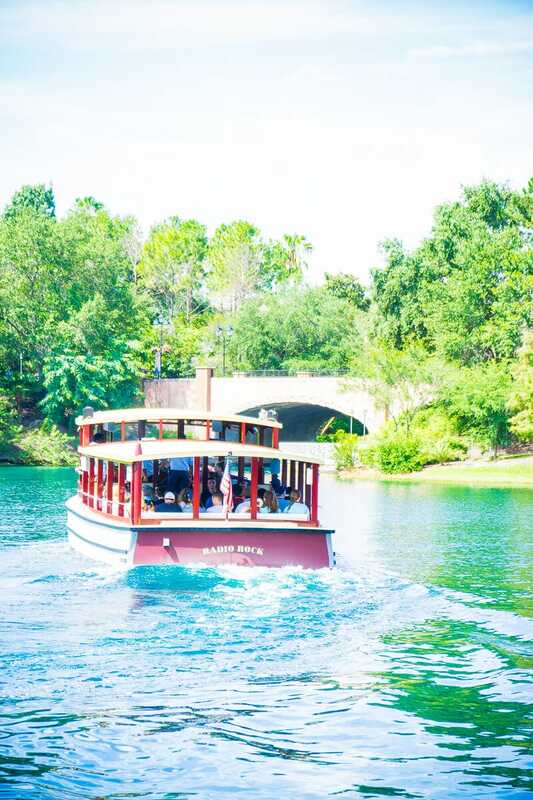 If you stay on-site at Universal Studios, you can reach the parks either by taking a quick water taxi (like 5-10 minutes tops) that drops you off in CityWalk minutes from the entrances to the two parks, or shuttle busses that drop you off at the front of the parks. We used the water taxi from Loews Portofino Bay at least 3-4x a day and never had to wait for more than five minutes for one to arrive. And unlike the shuttles that stop at a couple of hotels on the way, the water taxis go straight from the hotel dock to the CityWalk dock, so they literally only take a few minutes. 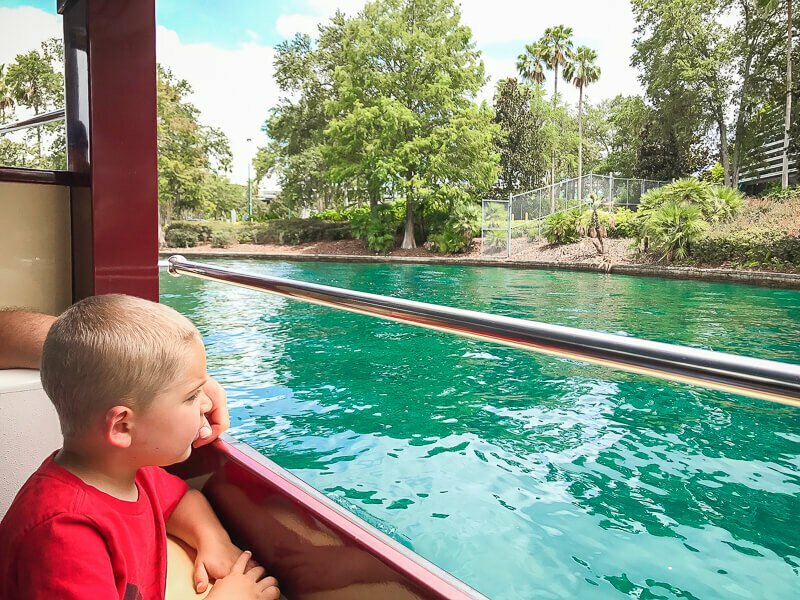 It’s pretty awesome and kids will love the boat ride. Best of all, if you have a stroller with you, just park it at the front of the boat and sit down. You don’t even have to fold it up or take anything out, it’s fantastic. We just parked at the Portofino Bay Hotel since we were staying there but if you’re staying off-site or just driving in for the day, parking starts at $20/car with additional options if you want premium parking, valet, etc. You can find more information about parking here. Strollers are available on-site to rent or you can bring in your own. If you’re renting a stroller, bring something to mark it so that you can find it when it’s grouped with other rental strollers. 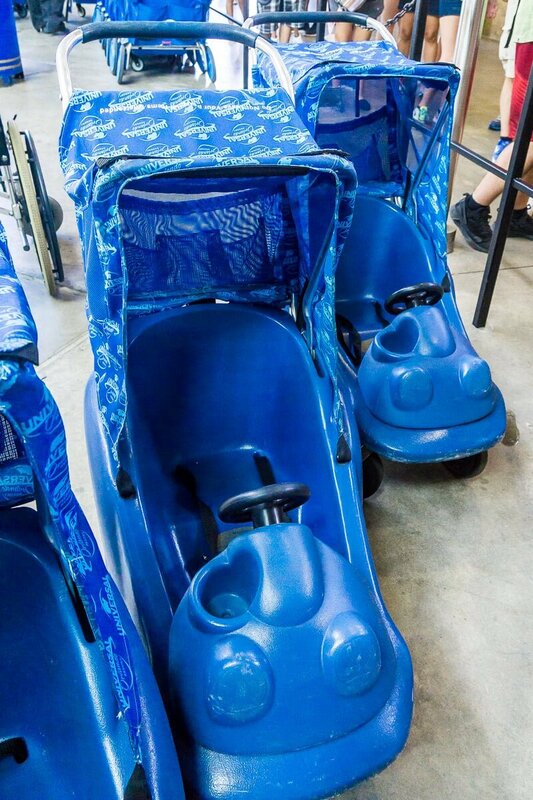 If you’re riding the Hogwarts Express, you’ll have to leave your rental stroller in the station and get a new one when you get to the next one. 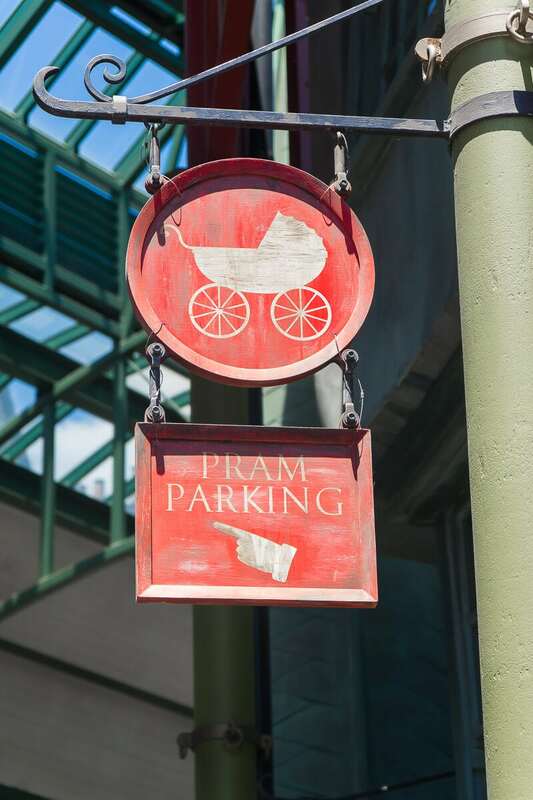 Lastly, make sure to park your stroller in stroller parking before you get on a ride. If you leave it just anywhere, an employee will move it to the designated stroller parking, and you’ll have to spend time looking for it after. I recommend checking out the online map before hitting the parks to get a sense of where things are and how the parks work. You can also download the Universal app that gives you a map, ride heights, wait times for rides, and more. This is especially important if you don’t have an express pass! 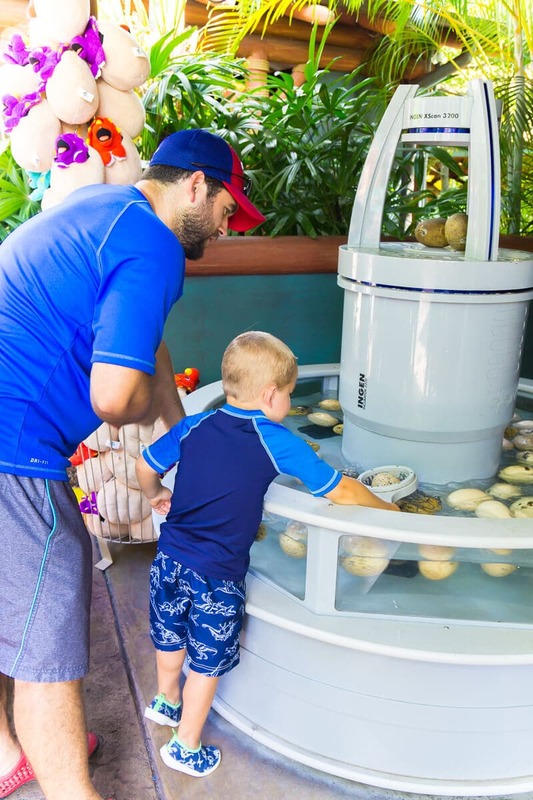 And if you’re staying at a premier hotel (Loews Portofino Bay Hotel, Loews Royal Pacific or Hard Rock Hotel), you also get these added benefits, which we definitely used during our stay! You pay a little more at these hotels, but the benefits are so good that it often makes up for the added cost! Priority seating at participating restaurants in the parks and CityWalk. This basically means that you jump to the front of the walk-in line if you don’t make reservations ahead of time. It typically cuts your wait time in half according to a handful of hosts I asked. If you need a break from rides or just somewhere to let your kids burn off a little energy, these kids’ play areas are perfect. 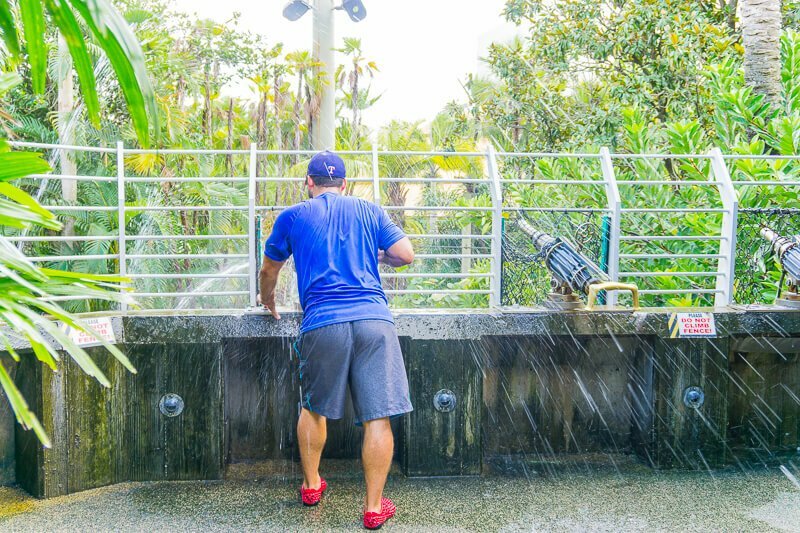 They are sprinkled throughout Universal Studios Orlando and Islands of Adventure and most give you the chance to get wet if you choose! Camp Jurassic is located in Jurassic Park and has plenty of tunnels, nets to climb up, slides, and dry areas to keep kids busy. 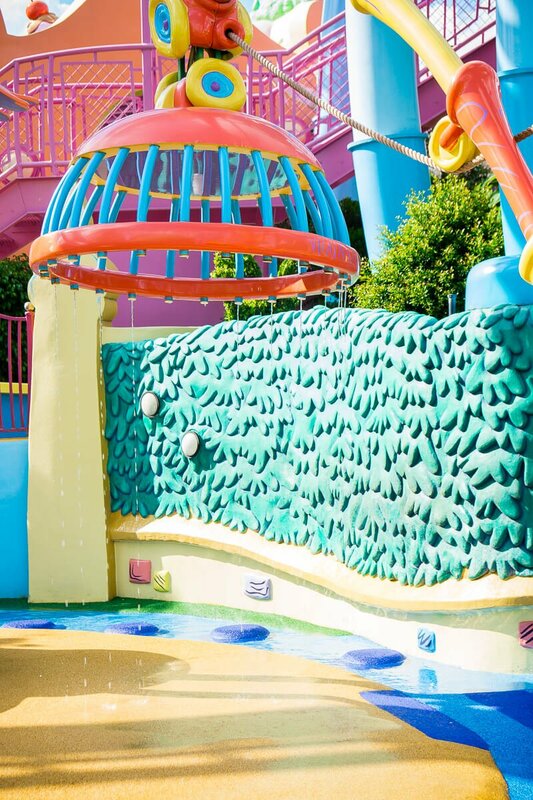 There is also a water play area with water guns to shoot at each other and a fountain area that sprays randomly. Beware, you will likely get soaked! Also within Camp Jurassic is the kids only ride, Pteradon Flyers. It’s for kids between 36-54″ tall only and if you don’t have a kid with you that is within those height ranges, you won’t be allowed to ride it. We saw many adults turned away from this “kids only” ride. 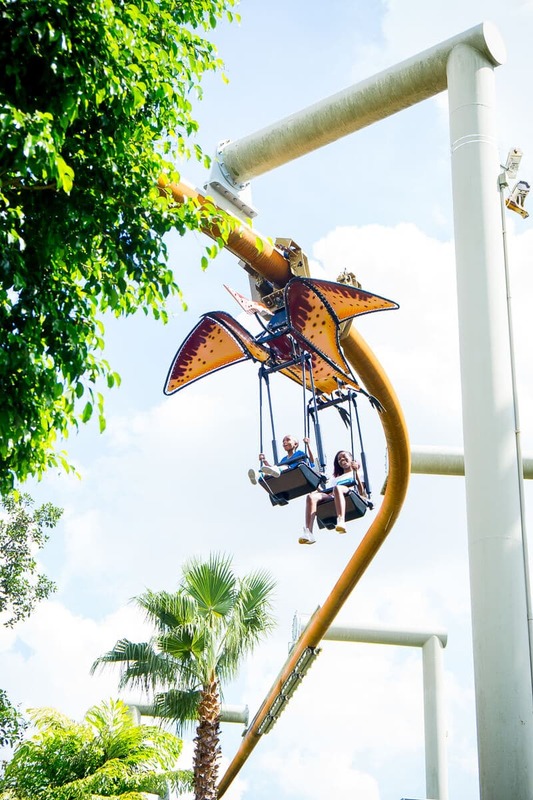 See the ride section for more tips on riding Pteradon Flyers. Discovery Center isn’t as much of a play area as an indoor interactive center all about dinosaurs. 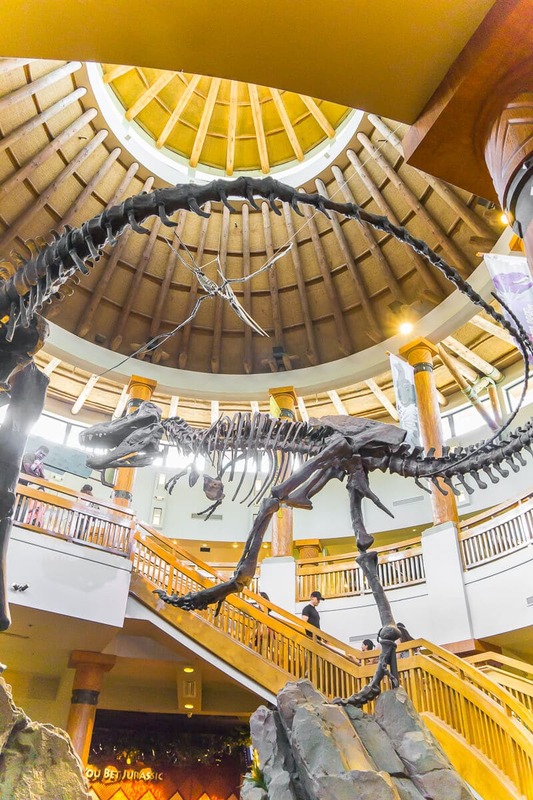 It’s full of fun games, activities, and educational things to do similar to what you’d expect to find at the Jurassic Park headquarters. Our favorites were a trivia game where you answered questions about dinosaurs, creating your own dinosaur (with your DNA + photo), and watching the baby dinosaur hatch and be named. It’s the perfect place to cool down for a bit and really fun if your kids like dinosaurs! The If I Ran A Zoo play area is a much quicker stop compared to some of the other play areas. The first section is kind of like a little Dr. Seuss themed maze that leads you to different interactive Dr. Seuss animals. For instance, at one of the stops my son had to step on a stair climber type thing to get the animal to pop out above him. 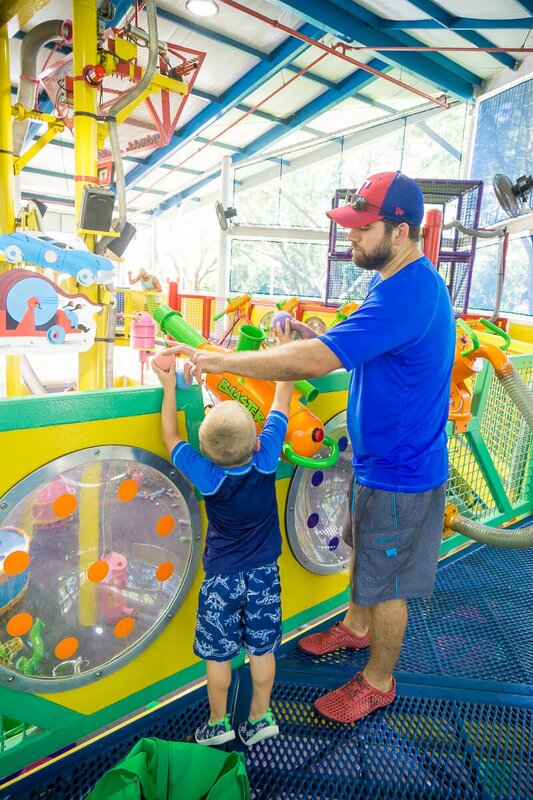 The same thing happens at the very end of the play area – there are a bunch of animals in the zoo that are interactive and fun but likely won’t keep your kids entertained for too long. In the middle of the maze and final zoo is a water area with a handful of water elements that would be great for a quick cool down. My son wasn’t in the mood to get wet so we didn’t stay long, but the kids there seemed to be having fun! 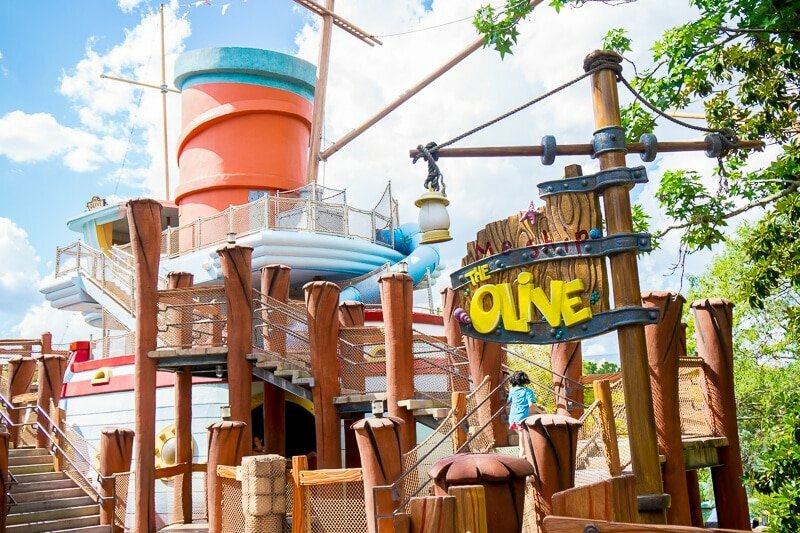 Ship Olive was the only play area across either parks that did not include water of any sort. It’s a big ship with slides, places to run around, and typical playground features. Out of all of the play areas, it was my family’s least favorite especially on a hot July day. Out of all of the play areas across both parks, Fievel’s Playland stood out the most for one reason — the huge water slide down the middle. The water slide is a raft water slide that is really fun for kids or adults. You do get a bit wet but not totally soaked. Tip: If you want to get a photo of someone coming down the slide, there’s a TV monitor near the bottom of the slide that shows you the person boarding up top. Use the monitor to see when your kid is coming down to get the perfect snapshot of them coming out of the chute! Outside of the water slide, the Fievel’s Playland has a ton of other dry elements as well — a big ball pit, a small bouncy house, a dinosaur bone slide, nets to climb, and a huge slide my son was a bit nervous about going on. We easily spent the most time here out of anywhere. 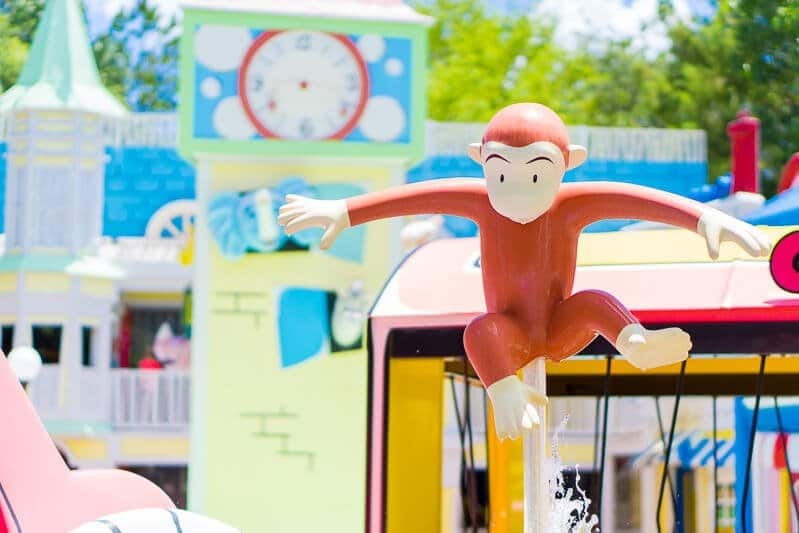 The Curious George play area is broken into two different sections — a huge water soak area in the front and a dry ball factory in the back. You can either go through the soak area to get to the ball factory or just go around the edges to avoid getting wet. The soak zone is the best water play area out of both of the parks. 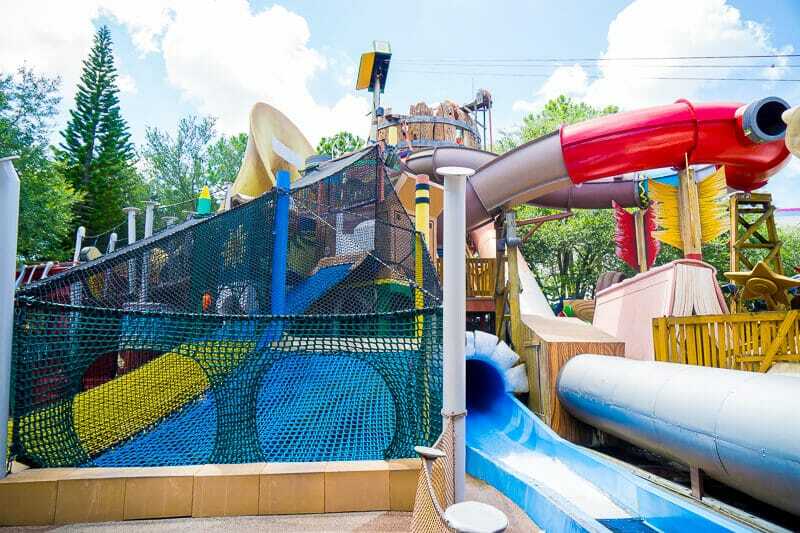 It’s designed for kids to get soaked with water guns to shoot, big soaker dump buckets, fountains spraying everywhere, and even a maze of fire poles for kids to run through. It’s colorful, fun, and perfect for a hot day. The ball factory in the back is another place you could spend a lot of time. It’s totally dry, indoor, and air conditioned making it a great break from a hot day if you don’t want to get wet. It’s similar to other ball areas I’ve been to where you can gather soft balls to shoot at each other, fill up large dumping baskets, and throw at one another. When you first walk into the Barney area, don’t be confused by the theater area at the back. There’s more than just an outdoor theater in the area. Head in and go to your left inside the building to find an indoor playground that seems more geared toward younger kids than any of the other play areas. It was easily the most empty of the play areas we saw and had a lot more toddlers than elementary school kids. 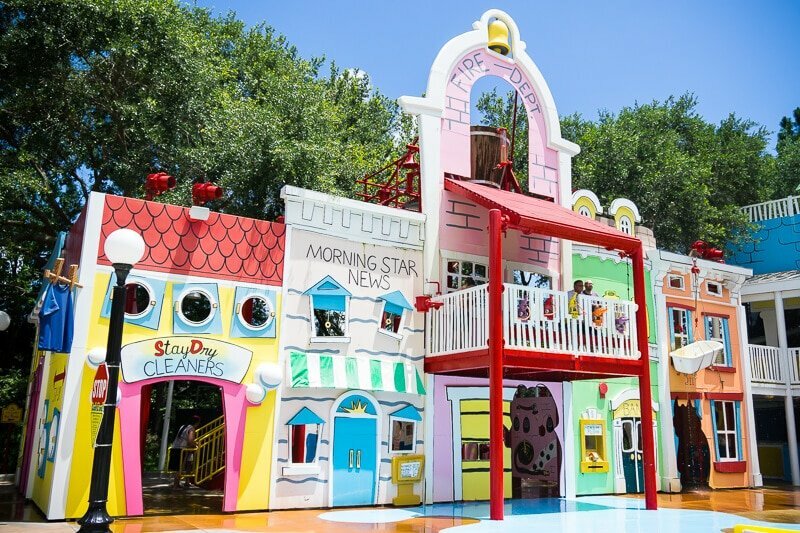 The playground consists of a big tree house with steps and slides, B.J.’s train to play on, an area to play with objects in a shallow river of water, and a 36″ and under play area. It’s dark, air conditioned, and would make a great place to stop for a few minutes if you needed a break from the heat or crowds. Throughout the park there are additional places kids can play that aren’t actually deemed a specific play area. If you need a break from rides, just keep an eye out for things like the spraying fountains in Toon Land, arcades, and games. 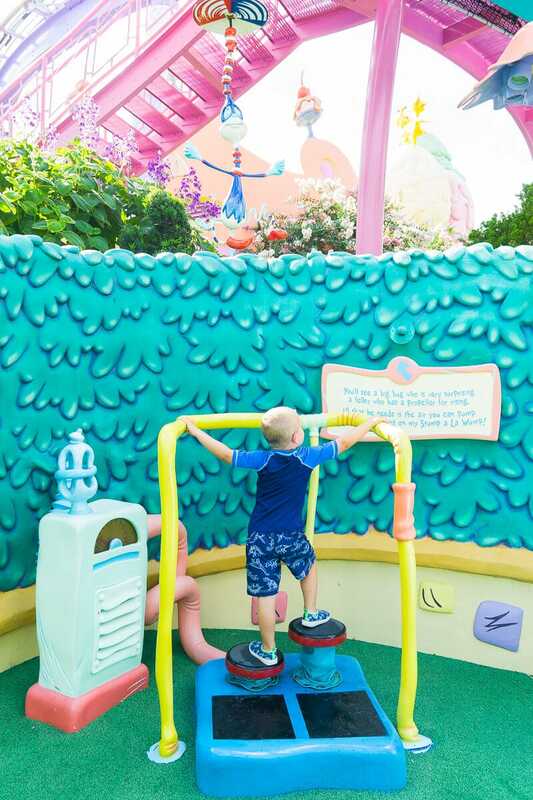 Pin this guide to Universal Studios Orlando kids’ play areas for later! 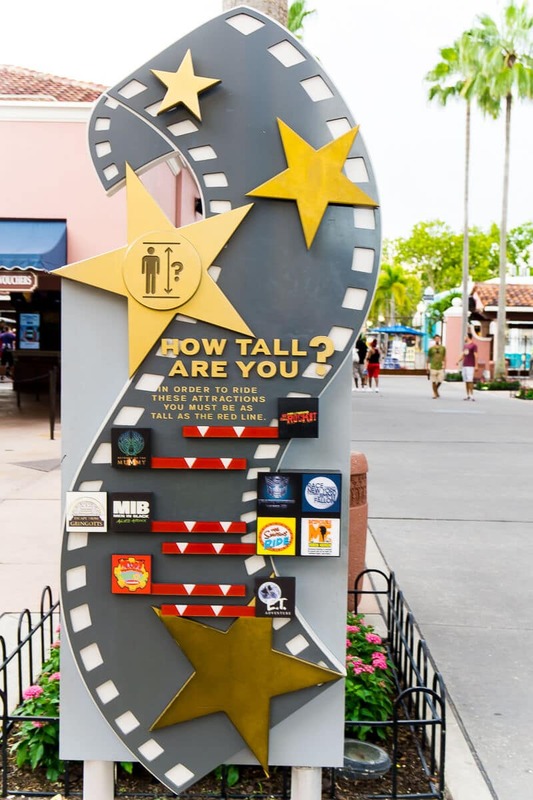 Since so many rides at Universal Studios are 3D or heavily themed based on movies and TV shows, when you’re choosing rides for your kids to go on, I recommend first checking their height against ride height requirements and then thinking about whether you’d be comfortable with your kids watching those shows/movies to decide if the ride is appropriate. Many of the rides are very reminiscent of the shows they’re based on. If part of your group wants to go on a ride but your younger kids (or someone) doesn’t, rides have a child swap room where the non-riding part of the group can wait while the others ride the ride. Once the first half of the group finishes, they can swap so that the second part of the group can ride. Two other things to keep in mind is that Universal has a ton of rides that are 3D. If you have a weak stomach, try to either limit these rides or at least balance them out with other attractions. We did like six 3D rides in a row, and I was very nauseous by the last one. And on said 3D rides, a number of them will spray you with a bit of water as an effect of the ride. This is one of the only rides we actually skipped out on. The description of the ride made it sound too much like the spinny rides that make my stomach queasy, but you can decide for yourself if it’s worth it. The description basically says you try to spin your car as quickly as you can to help save the planet. A 3D ride where you are journalists trying to catch the perfect photo of the bad guys and Spiderman is trying to keep you safe. We love this ride, but if your kids aren’t used to superhero shows with fighting bad guys, it could be a bit intense. Includes a bit of water sprays and momentarily intense heat. A 3D ride where you hop onto a safari type vehicle and head out into the jungle hoping you don’t run into Kong. It’s the Kong ride so of course you do but along the way you also run into a handful of disturbing creatures like a massive spider, huge water snake monster, and a dinosaur. My son enjoyed the ride, but he was definitely bit scared and grabbing my hand tight through the ride. Use your best judgement on this one depending on what you think your kids can handle. This may be the most confusing ride in the entire park. Pteradon Flyers is an awesome flying coaster type ride within Camp Jurassic, but it’s ONLY for kids that are 36-54″ tall. If an adult is with a kid, an adult can ride. If the adult is not with a kid that’s within those height ranges, the adult cannot ride. And if there are kids taller or shorter than that height limit, they can’t ride either unless they’re the “adult” with a shorter child. We saw plenty of adults and taller kids get turned away. The other thing to note is that this ride does not accept express passes, and they can only have a certain number of flyers on the track at at time. Instead of doing express pass, they’ve done a virtual line type thing where you get a card that tells you what time to return to ride once the wait gets too long. If you want to do this, I recommend doing it either early in the morning when the line isn’t long, or making sure to get your pass early and coming back later. It’s totally worth it in my opinion. This isn’t really a ride, but it’s not really a show either so it’s going in the ride category. You stand in line and wait for your chance to meet an animatronic raptor. It sounds lame, but it’s actually really cool because someone is controlling said raptor behind the scenes, so it actually feels like the raptor is real and reacting to the situation. 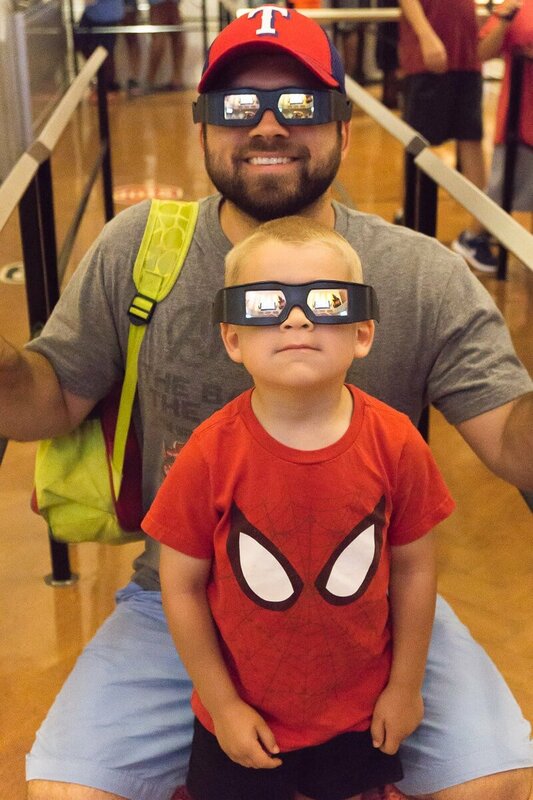 My son was a bit nervous at first but loves watching the video of the raptor petting the top of my head with his chin and getting in my husband’s face. If the line is short, this is definitely worth the wait for kids and adults. And if you have a Photo Pass, they have a professional photographer there taking photos for you. This ride is a fun and smooth kiddie coaster that goes around once and then you hop on. Other than the name and the head at the front of the coaster, there’s really nothing Harry Potter about it, but it’s a good introduction to the more intense rides kids will ride as they get older and taller. A smooth train ride high up in the air that rolls above Dr. Seuss and introduces you to Seussland in an alphabetical manner. 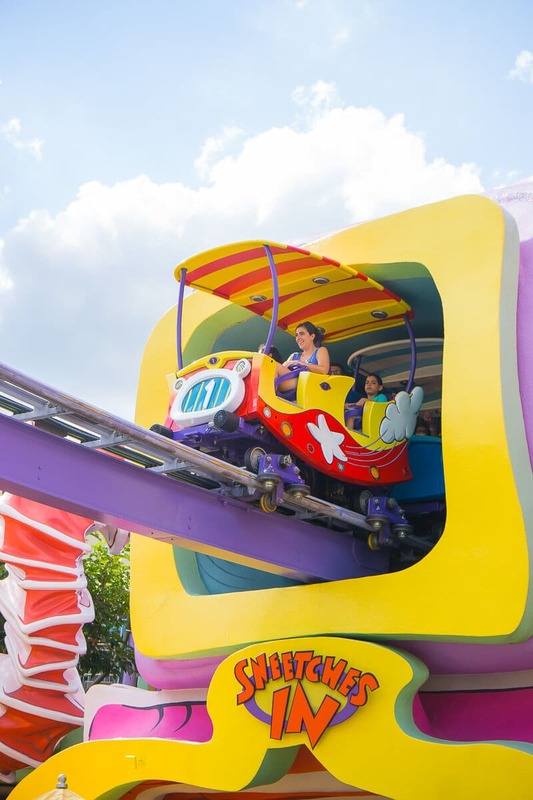 It’s a fun ride for kids and adults who like Dr. Seuss. Even if wait isn’t long, use your unlimited express pass if you have one to skip the long queue. 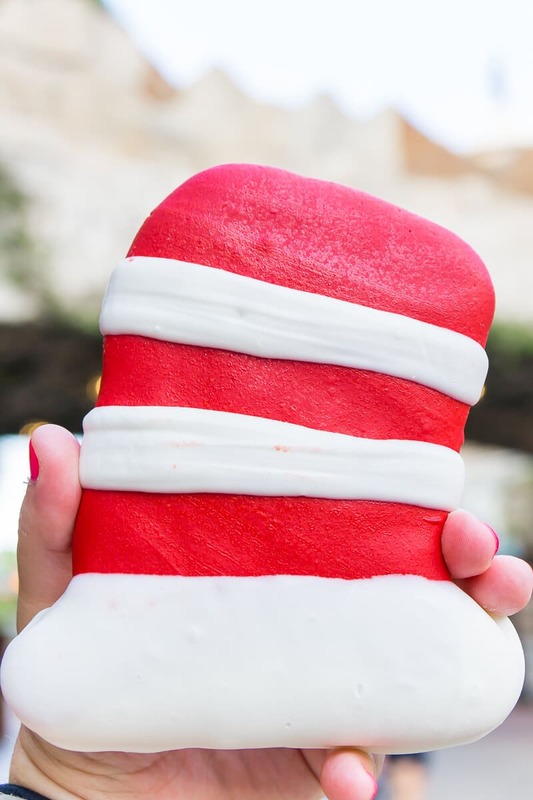 A slow moving ride where you sit in a little car and are driven through the original Cat in the Hat story. It’s cute but the Cat in the Hat is a bit creepy and probably my least favorite Dr. Seuss ride if you’re going to skip one. It’s definitely worth riding if you have some free time, especially for kids who are a fan of the book. Pick a fish, any fish and get inside. 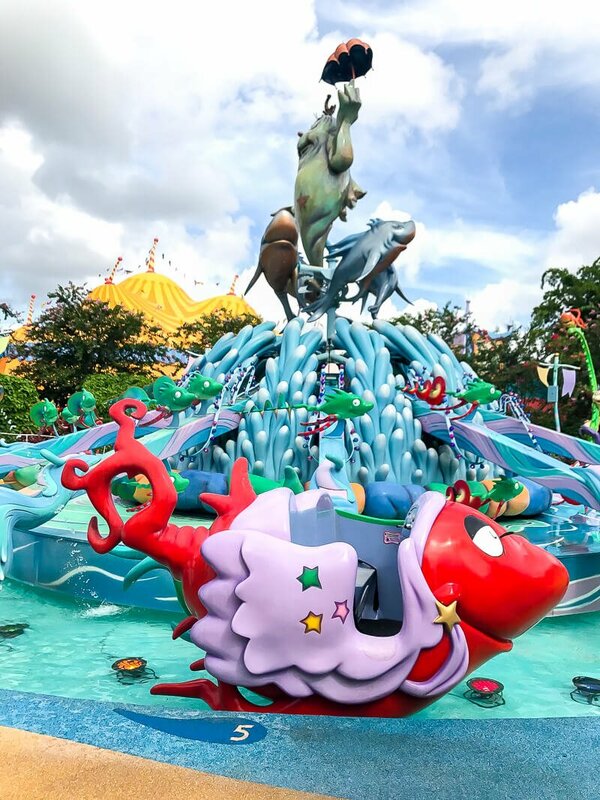 Ride in your fish around in a circle up and down and try not to get wet when the fish around the outside spray water out randomly in tune with a cute song the ride sings. Know ahead of time that you’re going to get wet, possibly even soaked, and this is really fun ride. We rode it a couple of times and tried our best to avoid the water by moving our fish up and down and still got wet. On a hot day, this one is a family favorite! 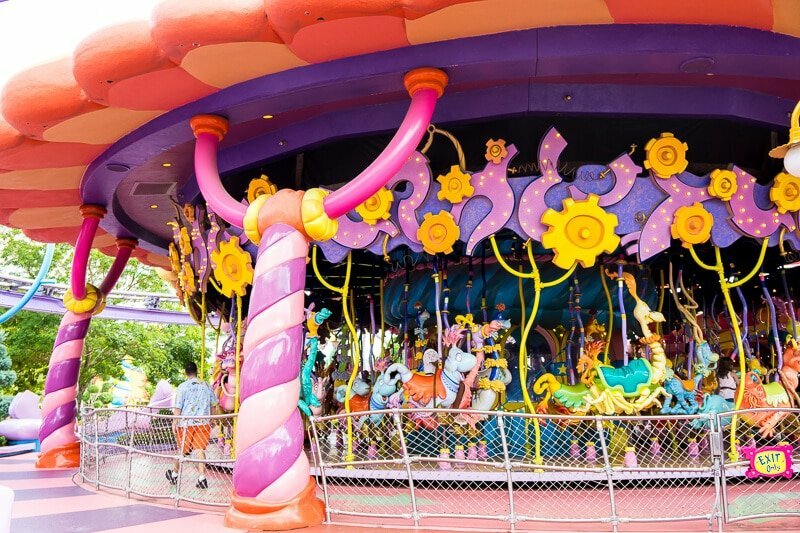 A standard carousel with Dr. Seuss type characters to ride instead of your standard lions, tigers, and horses. Good for all ages. 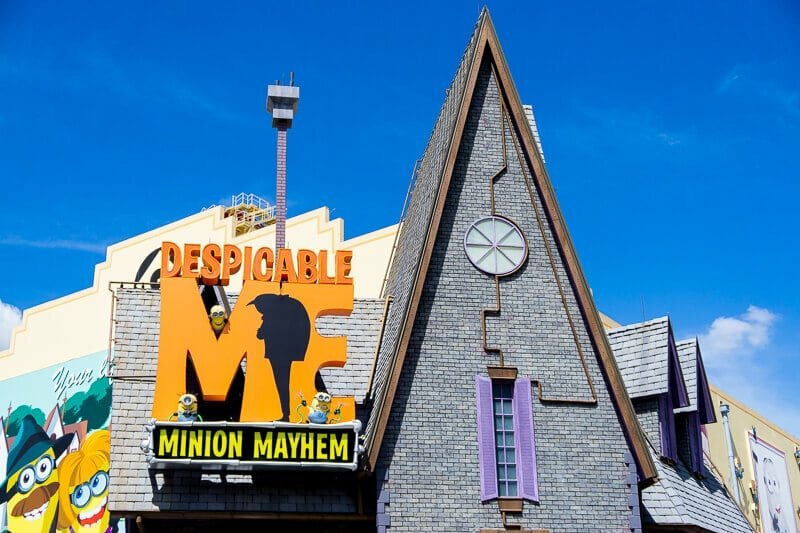 Out of all of the 3D rides between the two parks, Minion Mayhem was our absolute favorite, and we aren’t even that familiar with the movie. The plot was cute, the animation was awesome, and it was all just good family fun. If you like the movies or even if you don’t, this is a must-do for us! Transformers was a lot like the Spiderman ride. Transformers are trying to save the world from bad guys, and you’re along for the ride. The Transformers bad guys aren’t quite as scary as the Spiderman ones, but it can still be a little intense if your kids aren’t used to watching superhero or battle movies or TV shows. My son loves Rescue Bots, so he was a huge fan of this one! This is just a good classic ride where you ride bikes to try and get E.T. home to save his planet. It’s obviously old and outdated but still a lot of fun and one of my personal favorites. Even better if your kids have actually watched E.T. One of the things I love most about this ride is that in order to make it more fun for people who don’t watch The Tonight Show, they turned it into a race through New York. What kid doesn’t like a race? It’s a cute ride full of tons of things typically seen on The Tonight Show as well as New York scenery. 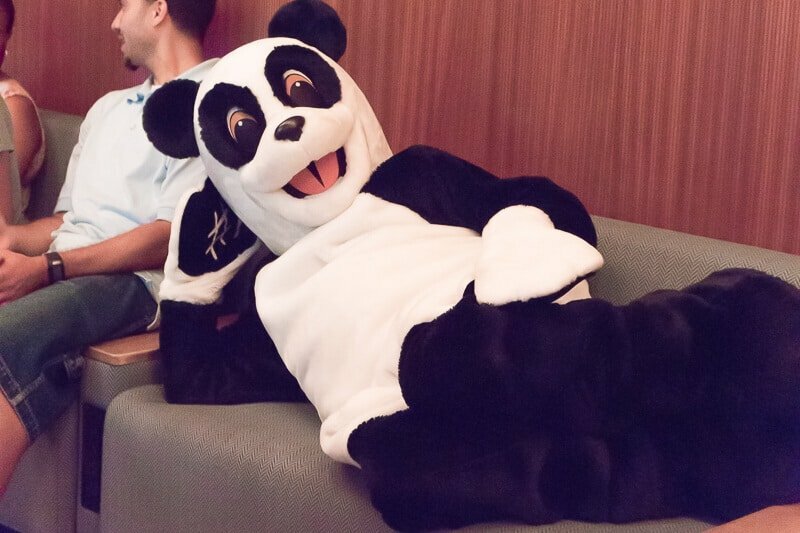 Definitely a fun one for everyone and don’t forget to give the Panda Hashtag (#) a high five if you see him! Shrek 4D is kind of a combo ride/show more than any of the other 3D rides at Universal. 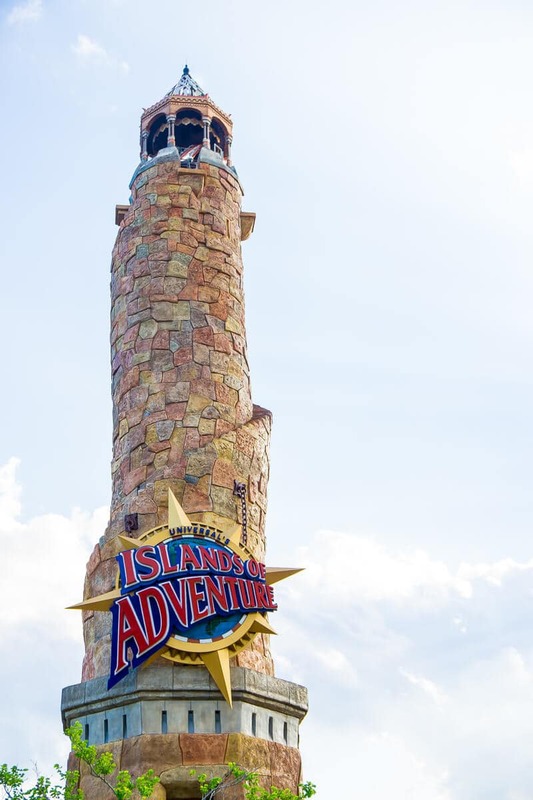 If your kids have watched Shrek or any of the Shrek movies, they’ll likely really enjoy this attraction because they borrow from the Shrek humor, characters, and theming throughout the experience. Once you’re actually in the show, the theater like seats move and interact with you in a way that you really do feel like you’re in the show you’re watching without being totally transported like in Spiderman or Transformers. This is the one ride I actually don’t recommend to anyone with young kids unless Simpsons is on at your home regularly. I actually forgot how much violence there is in the Simpsons since I haven’t watched it in years. 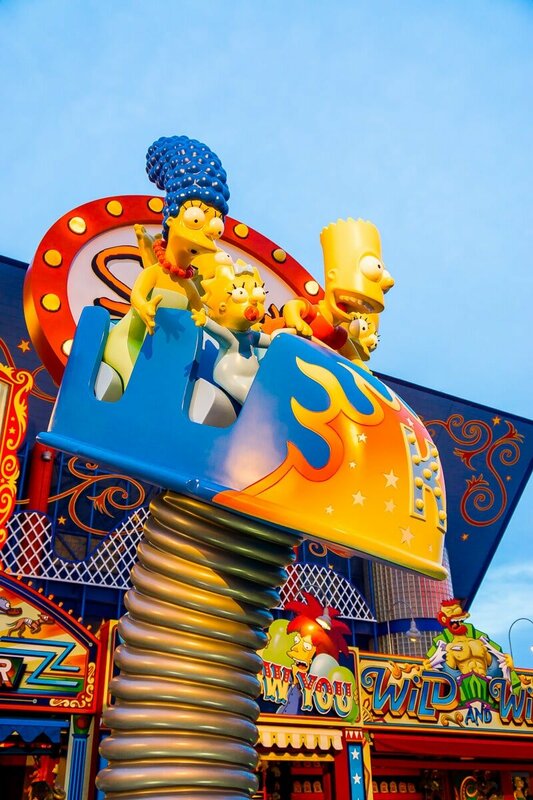 The ride is basically Sideshow Bob trying to kill the people on the roller coaster (you + the Simpsons Family), and it’s violent and a bit disturbing to be honest. When we got off this one, my son’s first comment was “that was a mean ride.” So no, I don’t recommend this one for anyone with young kids; there are way better rides out there for this age group. Pilot your own saucer that goes in a circle around the Simpsons aliens, Kang and Kodos. It’s fun, normally has a short line, and a good way to waste time if people are getting food in Springfield USA. This is a fun and fast kiddie coaster right around the corner from many of the Universal Studios play areas. My son loved it, but I’m glad I held on because it’s definitely faster than Flight of the Hippogriff in Islands of Adventure. 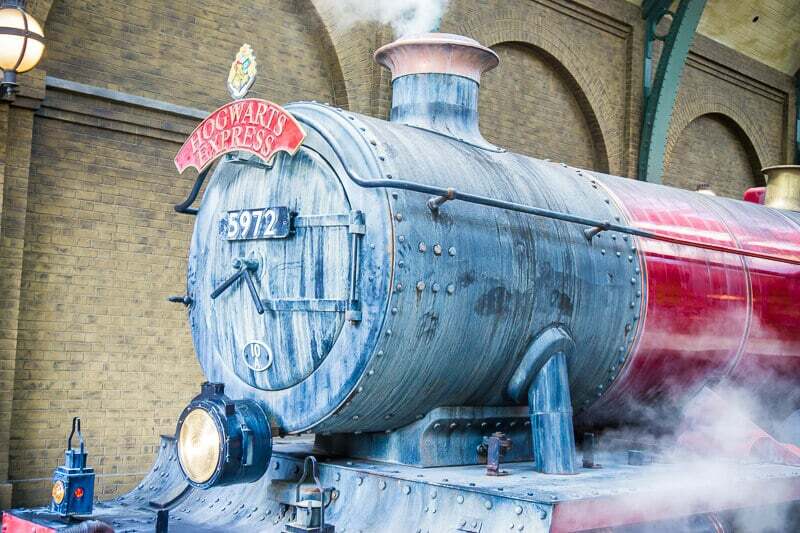 YOU MUST HAVE A PARK TO PARK PASS TO RIDE THE HOGWARTS EXPRESS! There are stations both in Diagon Alley (Universal Studios) and Hogsmeade (Islands of Adventure) and you need a park to park ticket because the train literally takes you directly into the other park. 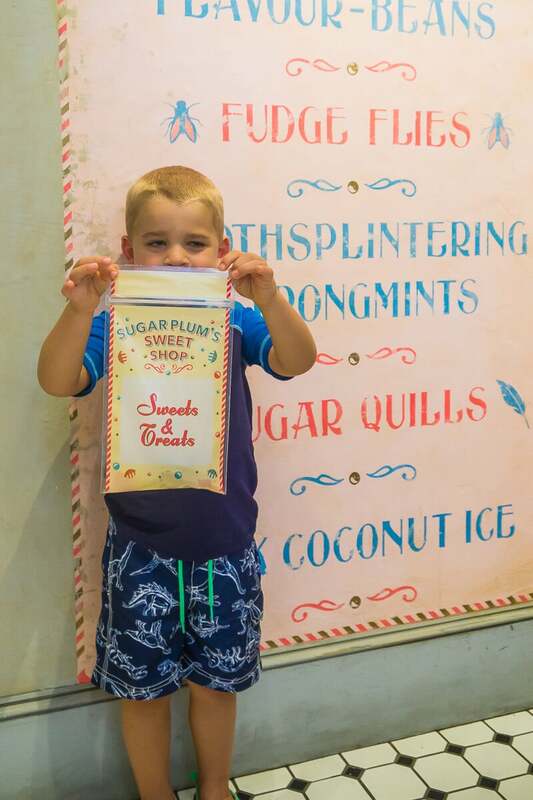 First, read my section of visiting Harry Potter world with young kids. And then know that even if your kids don’t get Harry Potter, they’ll get this train. And if they love Harry Potter, even better. You literally walk in the middle of walls marked platform 9 and 10 to arrive at platform 9 3/4 where you board a train that looks like the one from the movies. And it doesn’t stop there. 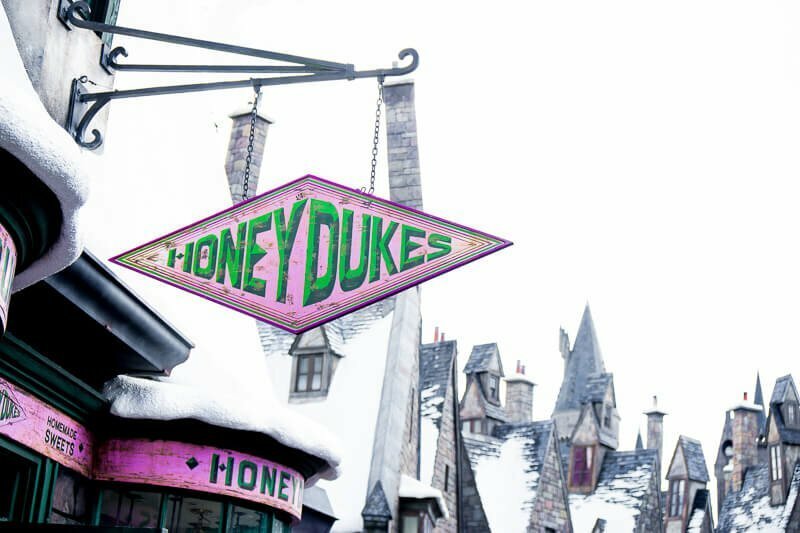 There are stations both in Diagon Alley (Universal Studios) and Hogsmeade (Islands of Adventure). I thought we were going on a regular train ride that just moved us from point A to point B, but the train is a ride all in itself. 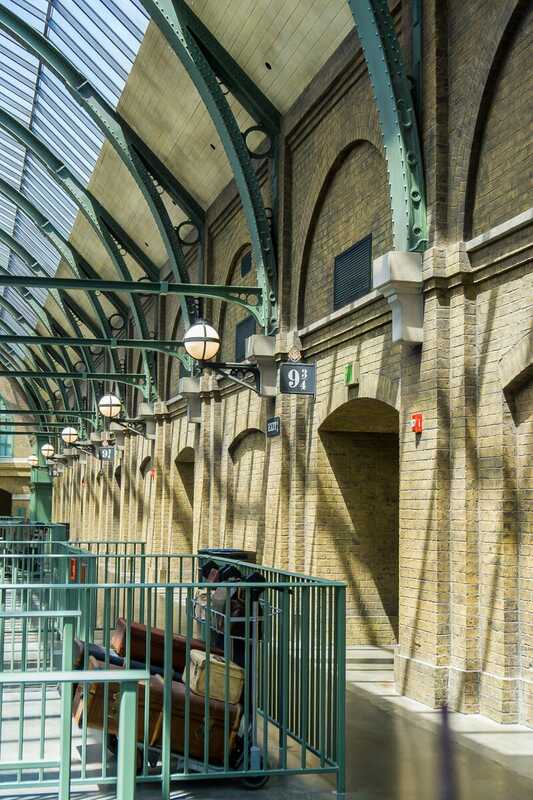 The windows are magical and show you what you’d likely see on a trip from Kings Cross Station to Hogwarts and outside your compartment doors, you’ll see a bit of magic as well. You’d think it might be a bit scary, but it’s really not at all. If you have a stroller, no need to fold it up. Leave it outside the train when you’re boarding and someone will park it in a stroller only section for you then get it for you again when you get off. It’s fantastic! 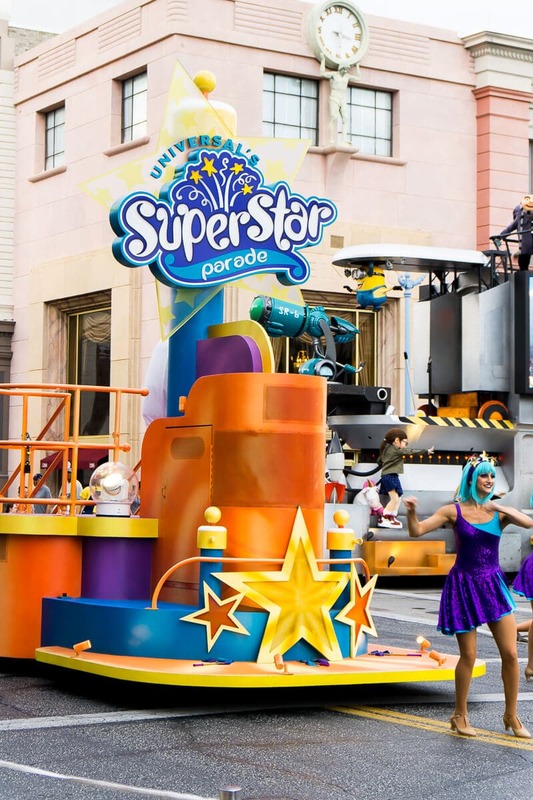 Pin this guide to Universal Studios rides for kids for later! 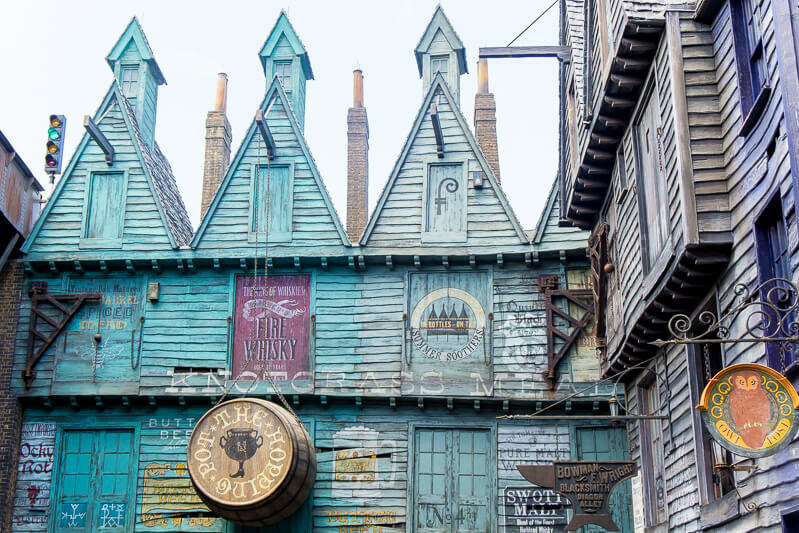 One of the biggest draws at Islands of Adventure and Universal Studios Orlando is the Wizarding World of Harry Potter – Hogsmeade and Diagon Alley. And I can tell you right now, I’ve never been more impressed with an immersive land than I was with Diagon Alley. If you have kids that know and love Harry Potter, both halves of the whole are incredible. 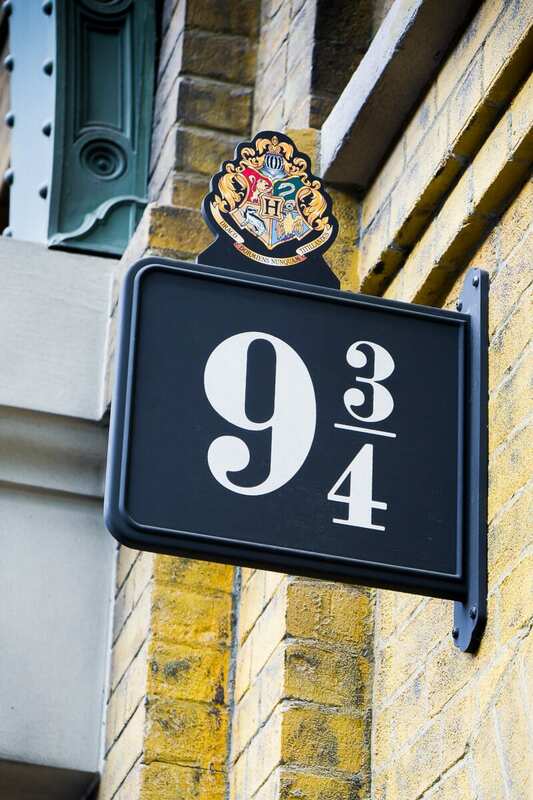 Seriously incredible, and you could stay in Harry Potter lands for your entire trip to be honest. But if you’re like me and have a kid who’s too young for Harry Potter or has never seen any of the movies or read any of the books, it’s a little tough. The incredible thing about the Harry Potter areas is how much they transport you into the world of Harry Potter. When you’re four and have no idea who Harry Potter is, you just don’t care. The line to get into the show for Ollivanders can be long and your young one is likely not going to get picked to be the child participant. If you want to see it, stand in line. If not, walk right past the line and enter to buy your wand at the next door. You want an interactive wand, not a regular one. The interactive ones all have gold labels on them and are a couple dollars more. 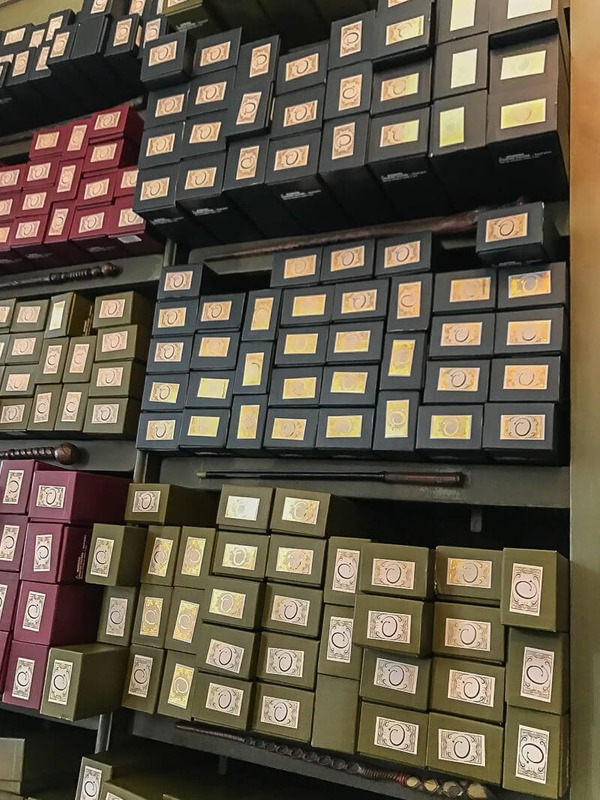 These are the wands you want! The other ones won’t let you do spells, which is one of the coolest part of the wands. The wand comes with a guide to where interactive spells are in Harry Potter world and what to do with your wand to “say” the spell. If you want to try out the interactive spells, take advantage of the early hour before the park opens (if you’re staying on-site) because the lines got crazy busy! Interactive spells can be a bit finicky because you just use your wrist movements, making them a bit hard for young kids. After getting his wand, my son wanted nothing to do with the spells. If your kids don’t care about Harry Potter, skip it. Blasphemy, I know. 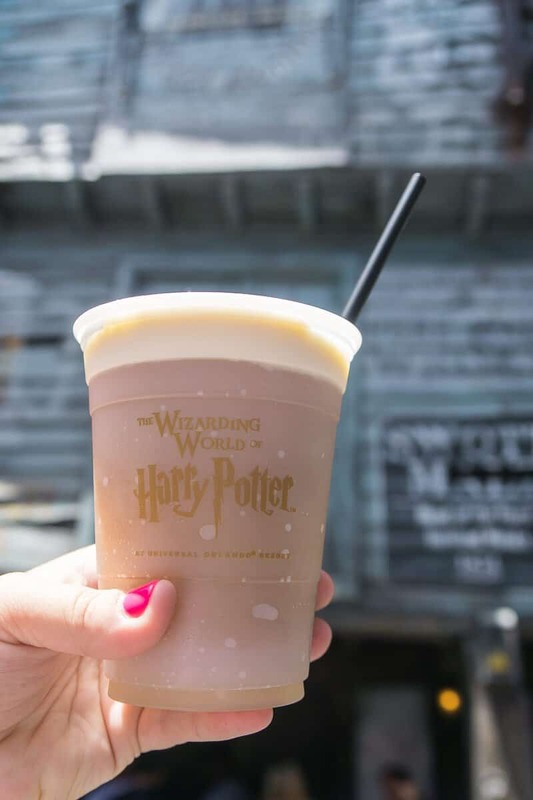 Or ride the Hogarts Express train between the two areas, get some chocolate frogs at HoneyDukes, ride Hippogriff, and try some Butterbeer then move on to things they will enjoy. Because you’ll never enjoy the experience if you have a little guy pulling at your hand telling you to move on to fun things. And luckily there are plenty of other things they will love! If you want to experience Harry Potter and your kids don’t, do your own child swap. Send one parent with the kids to one of the kids’ play areas then swap after a while. 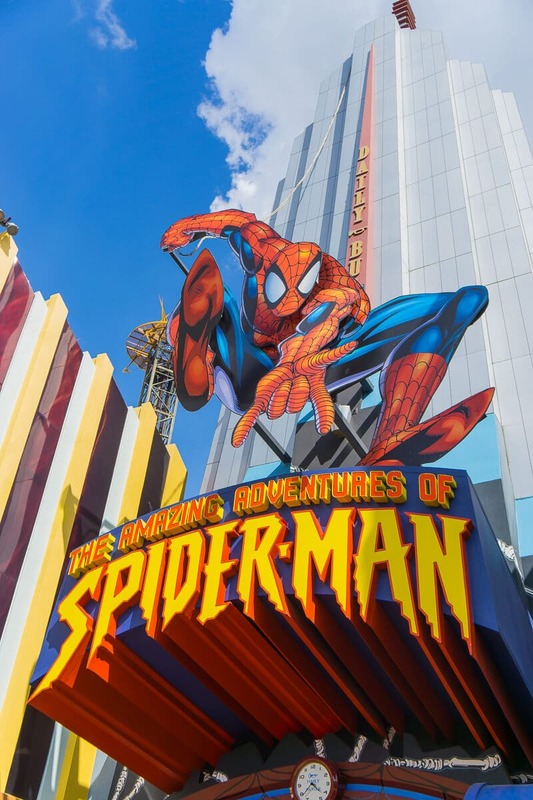 We didn’t spend too much time going to shows during our trip to Universal Studios, but there are a few standouts I highly recommend for kids. 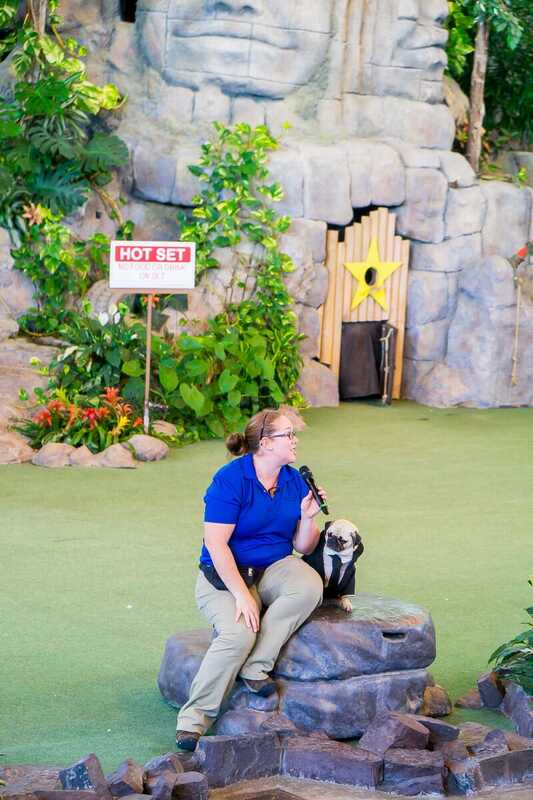 Animal trainers bring out animal actors from movies you’ve likely seen such as Marley from Marley & Me, Frank the Pug from Men in Black, and Beethoven in this quick 30 minute show. They work with the animals like birds, dogs, cats, and even pigs to do tricks and show the type of things the animals are taught to do for movies. It’s actually fascinating for adults and great for kids. My son loved it! I’ll be honest and say I was a bit disappointed by the parade. It started right in front of the Jimmy Fallon ride at Universal Studios and lasted just a few minutes and like five floats. If you’re in the area and your kids are fans of Despicable Me, SpongeBob, Dora, or Secret Life of Pets – it’s worth watching for a few minutes but definitely don’t spend all day scouting out a spot. There are a number of carnival type games throughout both the parks. Each game costs $6 and gives the chance to win a stuffed animal type prize. If your family likes games, you can buy a game play pass that gives you five games for $25, saving you $30. It’s great if you’re planning to play five games! 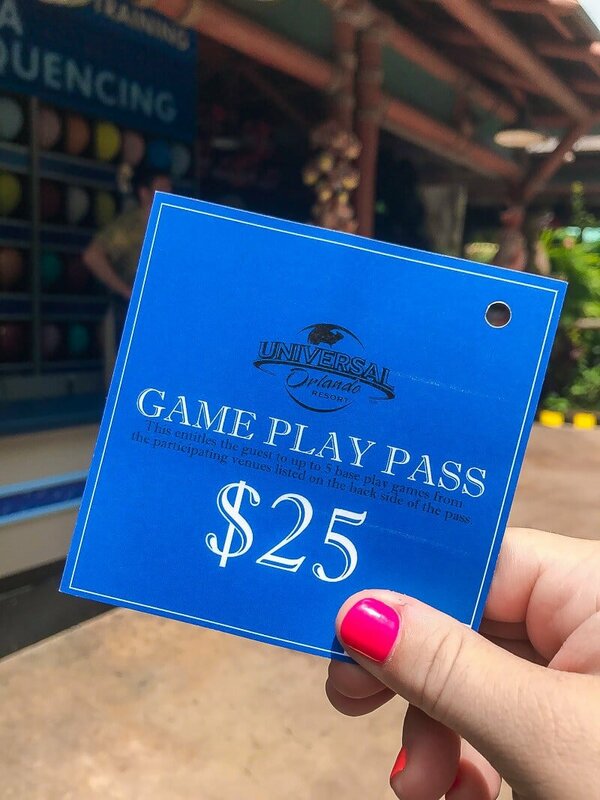 For young kids, there are three “always win” type games — the dino nursery in Jurassic Park where you pick a dino egg and see what dinosaur is inside, catch a fish in Springfield USA that’s just like the dino nursery, and a balloon pop game in Springfield USA. 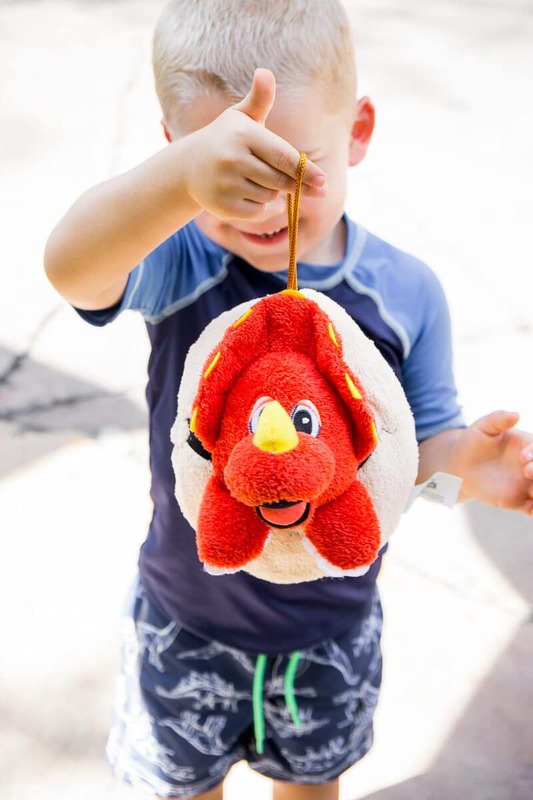 Those games are the best bet for young kids because they’re guaranteed to win a prize every time! My Universal Photos is basically a photo pass that allows you to get unlimited photos taken by the resident photographers throughout the parks. You can either do a 1-day or 3-day option for just a few more dollars ($69 vs $89) and share the pass with your family. We did the 3-day option and honestly, we only ended up taking about four pictures so for us it was totally not worth it. And that’s not because I don’t like photos, I do. I just didn’t see that many photographers around to take photos and the quality of the photos we did get weren’t fantastic, probably because my son hates photos and wouldn’t look at the camera. If you purchase My Universal Photos online, pick up your ticket for the photos at either the ticket desk or the will-call kiosk then take that ticket to the photo store right inside the park. You’ll trade the ticket in for a lanyard and the actual photo pass that photographers will scan to send the photos directly to your account. Bring at least one change of clothes per person, you’ll likely get wet. Or better yet, just wear swim clothes that will dry quickly and still bring a change of clothes just in case. Have a souvenir plan ahead of time because pretty much every ride ends in a souvenir and/or treat shop. If you tell your kids are the beginning of the day that they are going to get one souvenir, they’ll be less likely to beg in every shop. And if you know your young kids are going to beg for a treat in every shop, try letting them pick out like 2 or 3 items from the bulk candy dispensers in every candy store. It amounts to the same amount of sugar as one big treat and can tide them over for a few hours each time. Don’t let your kids watch the promo videos in the hotel room that goes through a bunch of the attractions in the park; watch one of the kid channels instead. There were a number of rides like Men in Black that my son wasn’t tall enough to ride, and he was devastated after watching the shooting alien ride on the promo. What they don’t know about won’t hurt them. Make sure to take lots of potty breaks, especially if you’re drinking a lot of water. It’s not as big of a deal if you’re using an express pass but if you’re standing in regular lines, make sure to take a potty break before getting in any lines that will be more than like 10-15 minutes. There’s nothing worse than having to get out of line to go to the bathroom after standing in that line for 30+ minutes. I’m not going to tell you to go to Spiderman first then Pteradon Flyers then Harry Potter. These are my tips for making the most out of your day with young kids. If you want a detailed touring plan, there are plenty of those available online! 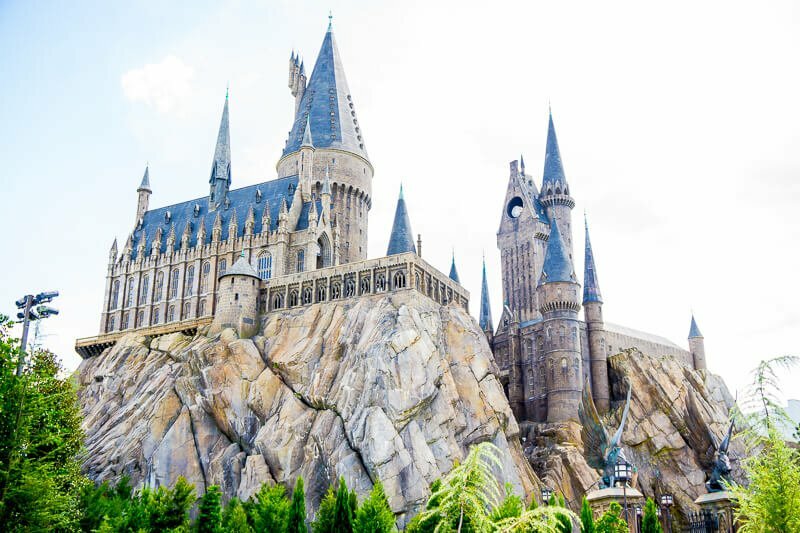 If you’re planning to do Harry Potter, get up early and take advantage of the hour early admission given to anyone staying at an on-site resort. I’ve heard of them opening the park even before the early hour so try to be there by 7:30 if the park opens at 8AM. Harry Potter gets extremely busy as soon as the park opens. Go hard for a couple of hours then head back to your resort to relax, nap, or just take a break. Don’t have a set touring plan. If you’re visiting with young kids, let them set the pace and choose the rides. You can eventually steer them toward everything you want to ride but if you let them help choose, you’ll have less meltdowns. Break up rides (especially 3D ones) with playing in one of the awesome play areas. 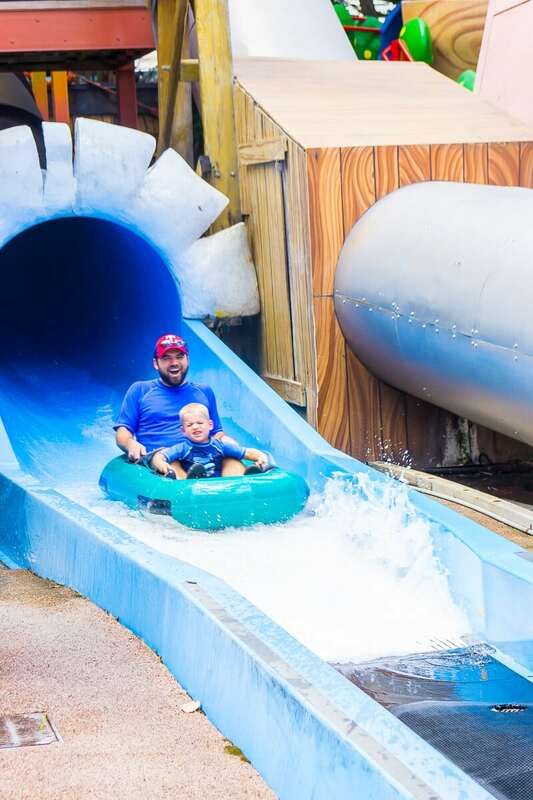 Or if your kids want to do only rides, try doing one day full of rides and one day full of playing and water areas with just a couple of duplicate rides from the first day. Ride Pteradon Flyers early in the day before they start giving the return to ride tickets. We were able to go twice in a row by going on it within the first hour the park opened. Don’t feel the need to go hard at the parks for every day of your vacation. Plan an extra day in and spend some time enjoying your hotel, swimming in the pool, sleeping in, watching a dive-in movie, exploring CityWalk, or one of the other awesome things to do in the resort area. Keep an eye out for characters walking around or set up in a meet and greet area. My son doesn’t love characters, so we didn’t do anything – but it’s free to meet the characters and take a photo with them. And definitely fun memories to take home if you’re willing to wait in the short lines for the photo! 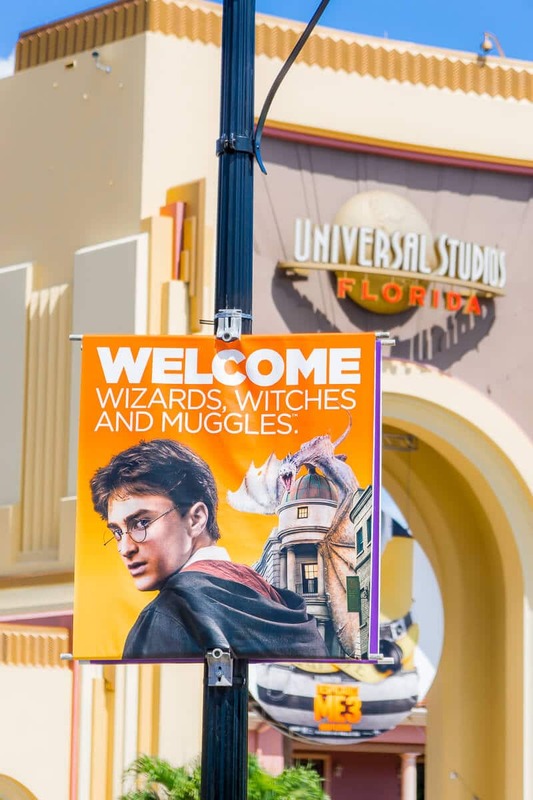 Pin this guide to visiting Universal Studios with kids for later! To get the real impact of Universal Studios and Islands of Adventure, I highly recommend watching these movies or TV shows before visiting. There are so many details and things within the theming that I’m sure I didn’t pick up because it’s been years since I’ve seen a lot of these. I’m already starting a movie marathon for our next visit! Oh and I’ve included all of the shows here, use your best judgement on which ones are appropriate for your kids. We definitely won’t let my 4-year-old watch them all (e.g., Simpsons). Wow, this was one of the best and most beneficial posts. So excited to hopefully plan a trip to universal soon!! Thanks for all of the great advice!